Plus, get your dream job in games, kickstart your Unity skills and create realistic clouds with FumeFX. 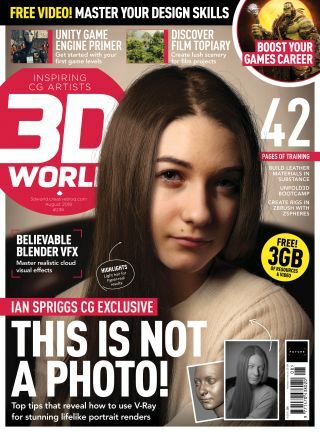 This issue we help you at excel at key tasks, from creating photorealistic portraits, integrating motion capture data into your scenes and setting up believable cloud simulations for your aerial shots. We offer a great guide, that shows you what to expect from a career in games as well as how to get your foot on the career ladder, or take the next step in your journey. There are also our regular Q and As, project insights and reviews of the latest gear. If you either want to work in games, or already do but are ready for the next step, then check out our feature where we show you what's on offer and give you some great tips to help you maximise what you offer, to get you where you want to be. Journey into some memorable CG forests with Ian Failes, who uncovers the secrets behind these detailed vistas, looking at projects, tools and techniques. Digital humans can be slightly off-putting and the closer to realism they get, the more off-putting they can be. Master portrait artist Ian Spriggs reveals how he overcomes this, with a detailed look at how he created our cover star. His rundown covers everything form modelling and texturing to lighting and rendering but, more importantly, he shares the reasoning behind his choices and his thoughts on historical references. In this iClone tutorial you will learn how to take motion capture data and use it to add life to your scenes without the need to animate by hand. Get to grips with FumeFX and learn how to create realistic cloud formations. Build the initial control meshes, right through to final rendering in this step by step tutorial.